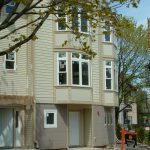 There’s only one unit left for sale in this new construction, six-unit townhouse development on the east side. 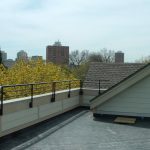 It’s the only condo development in Milwaukee to earn the Energy Star rating! This rating is given to homes designed to be at least 15% more energy efficient than is standard. This condo consistently tests close to 25% more efficient, according to results furnished by an independent inspector and includes the following items: 96.6% efficiency gas forced air furnace, and high efficiency air conditioning, gas water heater, appliances, insulated exterior walls, attic insulation, windows, exterior doors, and light fixtures. These features are designed to bring you long-term benefits and savings. With over 2,000 sq.ft.of living space, the condo itself is well worth a look! It’s a 3 bedroom, 2 1/2 bath, 2 garage, with one attached and one detached space included in the $314,500 asking price. 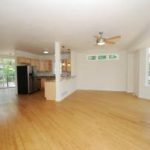 There is private street level entry into a foyer and a first level office ( or 3rd bedroom) with direct access to the very large, attached garage space. The next level offers wide bay windows, great room, eat-in kitchen, half bath, and balcony. Upstairs, there is a second bedroom with its own bath, a laundry area, and a master suite repeating the wide bay windows and leading up to a huge, private rooftop deck offering a panorama of views.